A warm hello to all my family and friends at this Christmas season. Today I only want to wish everyone of you a wonderful Christmas or Chanukah for my Jewish friends, and a happy upcoming New Years to all. I also want to say that the giveaway I had was a great success, and I will have more freebees in the near future to be sponsored by publisher. So, if you didn't take advantage of my last two giveaways, you still have a chance So, stay tuned to this station for more details. In the meantime, if you want to purchase Bridgetown High, it is still available on Facebook , Barnes & Noble, and several other places. So, until next week, as always, if you like this blog, please "Share" and "Like"it onnd "Tweet" it on Twitter. Then PLEASE, take five minutes to write a short review of "Bridgetown High" and post it on my author page at Amazon. Also, remember to sign up for my email letters on my Blog Site? I would love to see you there and have you introduce yourself and give comments to this blog. My best to all of you at this holiday season. 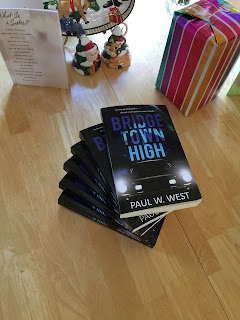 All kidding aside, I told you last week I might be able to do another give-away of my electronic copy of "Bridgetown High" if any of you missed it last go-round. So, I contacted my publisher (Limitless Publishing) doing another one and she informed me they can only do one give-away every three months. Well, that was a downer. Then, I realized that is through Amazon. However, I have the master electronic (.MOBI) copy file and can give away copies of "Bridgetown High" anytime I want. So, unless I hear from my publisher telling me otherwise, the give-away is on. But I'm not all altruistic, all I ask is that you submit your email address on the front page of this blog. That way you can keep up with me and my musings without having to find these posts through Facebook, Twitter, etc. and be prepared for when the sequel to "Bridgetown "High comes out. So, today I thought I'd talk a bit more from Dean Koontz's advice to would be authors -- well-drawn backgrounds. For those of you who have read "Bridgetown High," and are familiar with the setting (John Swett High School, the towns of Crockett, Rodeo, Port Costa, etc.) you will realize my descriptions were pretty close to real without detracting from the story. In fact, many of my scene settings actually proved to serve as characters in a sense. For instance, in Chapter 1, Mark is in a mortuary, about to throw up if he had to listen to any more of that morbid organ music. The mortuary, and more particular, the organ served as characters in that instance. Throughout the entire book I tried to make the setting as real as I could, hopefully to add interest to the scenes. So, how are you doing with your setting scenes? Write and let me know. I may be able to help just like I'm doing with a writer who asked for my help. I won't go into any details as those belong to her, but she does make the cardinal sin of not getting anyone into any kind of trouble and instead does a huge info dump throughout Chapter 1. I have to admit, it took me some time to get into the story, something that would turn many readers off. It's also a sign of an amateur writer. Ok, 'nuff said. So, So, until next week, as always, if you like this blog, please "Share" and "Like"it on Facebook , and "Tweet" it on Twitter. 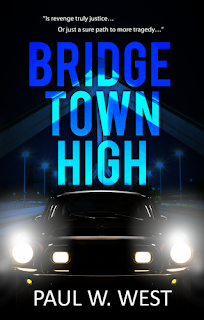 Then PLEASE, take five minutes to write a short review of "Bridgetown High" and post it on my author page at Amazon. Good afternoon all my family and friends. I just realized we only have 2 and 1/2 weeks to Christmas. So, is your shopping all done? Whether you are or not, in case you missed last month's sale, I'm considering doing it again. How does that sound? I appreciate all of you who responded so favorably, with kind comments and offers to post a review on Amazon. Thank you all. So, with Christmas so close, Bridgetown High could be a great Christmas gift for your young adults, and even adults. So, today I thought I would go against everything you've been taught about how to put together a novel. I'm borrowing this from one of my favorite novelists, Jack London. If any of you have read his biography, "Sailor on Horseback," by Irving Stone, you might remember how London put together his novels. Before I go into that, however, I want to go over what I've learned from all my contemporary writers. Common wisdom says to start writing something without stopping to check spelling or to fix poor sentences, just write from the opening and work to the final word. Then we are told to go back over and edit, edit, edit! Well, that makes sense, in a way, but I can't do it that way. As I write, I find myself pausing to fix something and in the process take a moment to think about where I want to go with what I'm currently working on. Now, as I think back on Jack London's method, I realize I'm not too far from doing it his way. At first, I got a kick out of how London wrote. His method was to write a scene, a chapter, a concept, etc. with no idea of a plot or where it fit in the plot at first. I know, I told you having a plot is one of the most important aspects of a novel. But, after writing something, London would hang the pages on a clothes line, then rearrange them as he thought it over. That's kind of how I do it, only I use a computer. Much more efficient. As I was writing during my lunch break yesterday, I found myself adding to chapters already written, and moving chapters around to where they would fit better. I wonder how many of you use the London method -- via a computer. I'll let you stew about that for a while. So, until next week, as always, if you like this blog, please "Share" and "Like"it on Facebook , and "Re-tweet" it on Twitter. Then PLEASE, take five minutes to write a short review of "Bridgetown High" and post it on my author page at Amazon. Also, if you are reading this on my blog, have you signed up for my email letters on my Blog Site? I would love to see you there and have you introduce yourself and give comments to this blog. Hi to all my friends and family. I know, you're asking "get what?" If you missed it I held a big sale last week. I was giving away free copies of "Bridgetown High." I hope, if you didn't already have a copy, that you used this opportunity to get a free copy, then tell all your "friends" on Facebook, Twitter, etc. all about it. That's the only way I'll ever get known in the literary world. But don't get too excited if you missed the sale. I'm planning another sale in a week or so (in time for Christmas). I think "Bridgetown High" would be a great Christmas Present for your teenage children or even adults. Most of the readers have been middle-aged adults as they reminisce about life during the turbulent 60s. Just a thought. I promised I would offer some writerly tips in this blog. If some of you recall, I was in the process of talking about what Dean Koontz's high school English teacher told him about writing fiction. The first thing she suggested is to have "a strong plot." that may sound obvious, but there are some who ignore that rule and up with a literary novel, which in my mind isn't a novel at all. So, does your novel have a strong plot? Does it begin with an enticing story question or questions? Then does it work toward solving those questions at the end? Does it have strong sub-plots that are also resolved by the end? The story questions are what drive the plot. Certainly, you need to have a lot of twists and turns in the story line, but they all have to be resolved by the end. So while you're pondering all that, I'll say, until next week, as always, if you like this blog, please "Share" and "Like"it on Facebook , and "Re-tweet" it on Twitter. 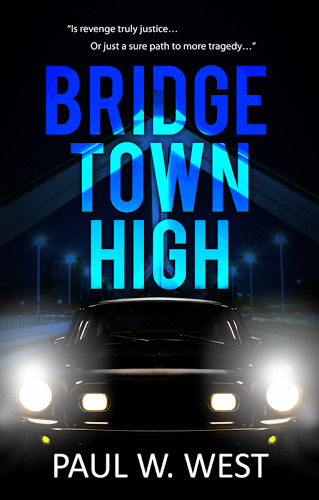 Then PLEASE, take five minutes to write a short review of "Bridgetown High" and post it on my author page at Amazon.